Back when I was still riding in Brooklyn, I wrote about how I’d heard of an internship program out in New Mexico for taming wild mustangs. I was very demoralized at the time, feeling trapped in my life there and like I’d never have the opportunity to do something like that. Life is quite a bit different now than it was then. I’m now a freelancer instead of a commuter, and it gives me the opportunity to move around and explore the country in ways I’ve only dreamed of. It’s opening me up to looking at what is really important to me and forcing me to give up the excuses and take action. 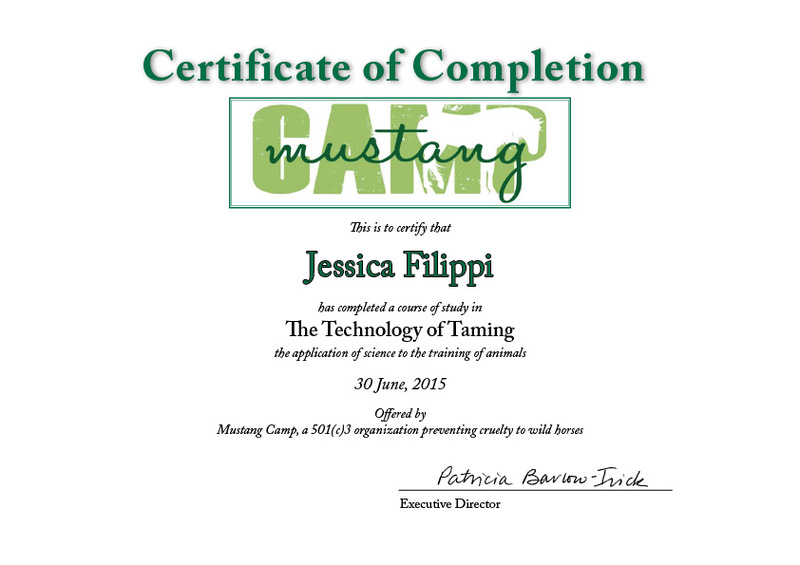 To that end, I recently completed the online course offered by the mustang camp that does the internships. I wasn’t able to go out there and learn in person, but you have to work with what you have in front of you. The course was focused on using the principles Applied Behavior Analysis to taming and training wild mustangs. The skills taught can be generalized to any animal, but Mustang Camp is a non-profit organization focused specifically on the preventing cruelty to the wild horses that are rounded up by the Bureau of Land Management each year. The Bureau of Land Management and the U.S. Forest Service now manage these herds, but it requires a difficult balance to prevent the herds from overwhelming the small amount of public lands available to sustain them. The solution since 1973 has been to round up excess horses and to adopt them out to private owners. You can adopt a horse directly from the BLM for only about $200 if you have the required facilities; they have an internet adoption site that I look at all the time and fantasize about bringing a mustang home. However, these are wild animals that have had very little–and often unpleasant–associations with humans. The BLM therefore has a program where it sends its horses out to trainers who gentle the animals and then adopt them out to private owners. (I wrote before about the movie “Wild Horse, Wild Ride” that chronicles the Extreme Mustang Makeover Challenge, wherein 100 people take home 100 horses for 100 days and then showcase them at a competition and auction). On a much smaller scale, this is what Mustang Camp does. Using humane techniques based on teaching the animals rewards and consequences, the horses are trained to accept human touch, allow grooming and veterinary care, and willingly board a trailer. I would have loved to get out to New Mexico for a month to get the hands-on experience, but it just wasn’t feasible. Perhaps sometime in the future. But in the meantime, the online course was challenging and interesting, giving me new insight into animal behavior that I have brought to my interactions with horses as a rider. (It also has brought new insights into interactions with my cats. As I said, the principles are good for all kinds of animals; cats are notoriously independent and sometimes seem all but untrainable, but that’s not really the case). It also felt good to be getting training/education in an area that has always fascinated me: animal behavior. Doing the readings and working on the assignments brought me back to how much I enjoyed my grad school courses and makes me wonder if now’s the time to go back to school for a career change. Actually, it wouldn’t be so much a career change as it would be returning to the field that I started out working in as a teenager: environmental education and wildlife conservation.